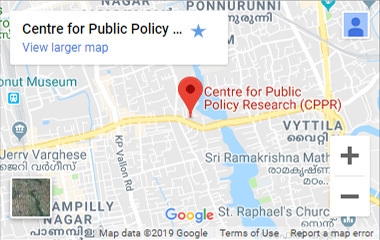 The CPPR Centre for Urban Studies (CUS) focuses on urbanisation patterns and trends in aspects such as public space, urban mobility, infrastructure, technology, livelihood and citizenship. The centre aims to understand the contestation of space by different socio-economic groups and addresses the multiple realities that exist within a city. It also aims to meet the challenges of urban development by recommending better practices and innovative policy changes. This is done through the use of primary and secondary quantitative data, to support qualitative policy suggestions. CUS aims to work with public and private entities to ensure sustainability through shared ownership. Raj Cherubal is the Director-Projects for Chennai City Connect (CCC). At CCC, he has facilitated various projects on traffic, sustainable transportation and urban planning focused on pedestrians and pedestrianisation, Bus Rapid Transit (BRT) and integrated, multi-modal public transportation, sustainable solid waste management, restoration of urban water bodies, sustainable financing of urban infrastructure, redevelopment of business district and regional planning. He has written and worked to promote decentralisation and good urban governance. Also to promote economic freedom for entrepreneurs, especially poor like street vendors and others in the informal sector and for their recognition as profit seeking entrepreneurs. He holds an MS in Physics from the University of Louisville and an MS in Nuclear Engineering from the University of Michigan, Ann Arbor. He has worked in the software industry in areas like computational physics, visualisation, telecom and finance. Susan Zielinski is former Managing Director of Sustainable Mobility & Accessibility Research & Transformation (SMART), which is a project of the University of Michigan Transportation Research Institute and the Taubman College of Architecture and Urban Planning. She co-founded and directed Moving the Economy (MTE), a Canada-wide ‘link tank’ that works to catalyse and support sustainable urban transportation innovation as well as New Mobility industry development, an integrated industry approach developed at MTE. She has worked for over 15 years developing and leading transportation and liveability policies and initiatives.